Recycling household items: the fan & copper; is it really worth it? Since metals were first molded and forged, there have been people that have collected the broken parts and pieces to salvage or reuse. Since WWII engineers have been incorporating plastics into machines. Three reasons for this are: a)to reduce the cost of manufacturing b) reduce the shipping weight and c) ease and speed of manufacture. With the increase of plastics into all forms of consumer life, the value of breaking machines into their base materials becomes a time consuming practice into fined tuned materials organization. In looking at the common household fan, there are 4 basic composition of materials. Most upright and box fans have a mixture of plastic and pot metal in the base, fan casing and outer housing. These are fairly easy to separate and generally require nothing more than a simple Phillips screwdriver. The plastics are generally injection molded and may be stamped with recycling codes, but are not always. This is especially true if there are gears in the motor housing. Even if recycling is available in your area, the small pieces will likely fall through commercialized sorting machines. However, small scale solutions like those utilized in the Precious Plastic community designed plastic recycling machines will use the small parts effectively, preventing them from destroying the environment. The motor of an standard household fan – made of copper and steel this should never go to a landfill. Depending on manufacturer, the fan housing may be made of plastic, tin or zinc. The same goes for fan blades which may be Plastic, Steele or Aluminum. By removing the protective housing and blades we come to the main motor assembly. This is where we’ll get our majority of metal parts as there are generally a dozen screws, 4 bolts and 4 nuts for those bolts. Broken Down – the parts of a oscillating fan include many extruded plastics, screws and few pieces of metal. The most valuable of these is the copper. The various parts can be separated into containers by type. In many areas of the world, recycling bins for iron metals is not a revenue generating option. Causes may be a lack of access to materials collectors, as well as shipping or transportation costs. Unlike most cities in the United States, many island nations face daunting shipping costs and regulations that make low value iron blends, often referred to as pot metal, to expensive to gather and ship. Items like screw’s may be saved for use in other projects but often end up as waste when storage space is at a minimum. Business like e waste recycling will have different methodologies for these items. One key is that specifically separated items that are the same add significant metal weight when collected in bulk. Examples of this are metal housings, magnet, brass or aluminum screws. The real bread and butter piece you will see is the copper from the motor itself and the electrical wires. When it comes to metals, non ferrous materials are the most important within this unit. Individually, one fan will contain about one lb of copper. The average price of clean copper is still above above$ 2.00 lb. (USA), down from $4.00 about five years ago. One of the most important rules to remember is that the cleaner the metal, the greater the financial yield. For most this will require getting out an electrical saw and in the case of our fan, cutting the motor core to separate the copper and plate steel. 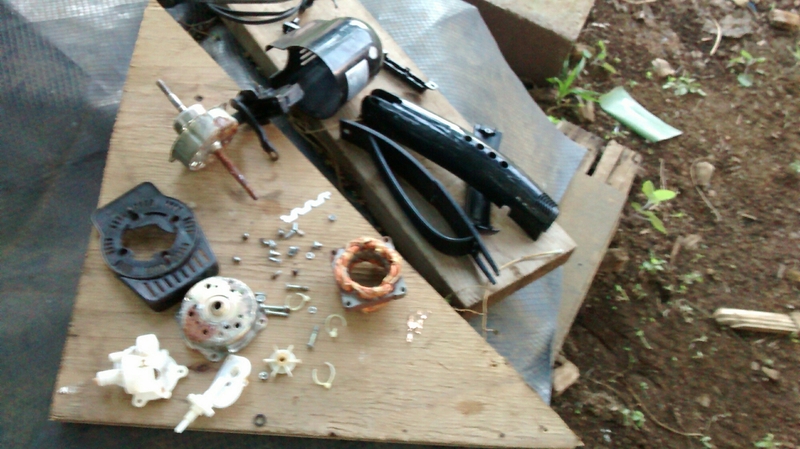 Most DIY electronics recyclers will save up a quantity of several dozen motor assemblies before cutting the copper from the pressed steel core. This will save time and energy by setting up task oriented jobs to be done concurrently ( at the same time). This work will require an electronic saw, and a reciprocating saw is generally considered the best tool for this job. The payout? It depends on the size of the fan. For most people the answer is: Maybe $1.00 in copper $0.02 in steel and $.001 in tin ( waste steel). This of course depends on if you live somewhere that all of these metals are purchased. If not, then the end result is a about $1.00 for your copper. Stripping the wires will add no more than another $0.25 to the pile. While this may not seem like a significant amount of money for someone living in the US or Europe, these metals are worth collecting, sometimes for months or years before turning in a large quantity to get the best price from the smelter or scrap purchaser. With non-ferrous metals, the larger the quantity of clean metal, the better the price. Ensuring that broken parts that are mixed metals are separate will get the best prices, even though it may seem tiresome. The problem for most of us is very simple – who wants to go through all that work? In the end is it really worth it? Most people would agree that they would never take the time to take apart their fan for recycling. Most of us are content to just put it at the curb and forget about it. However, the realities of life don’t work like this. While many people don’t understand the intricacies of waste management, including the efforts of ‘garbage companies’ to reduce the quantities of human consumption finding their ways into burial sites (also known as landfills). The mental thought processes regarding our waste streams must continue, as must our dialogue. Every time we make a consumption decision, there is a long term impact on our planet. For more reading enjoy this article by Waste Drive on why “Zero Waste” isn’t everything people think it is. Time consuming or not, every time I see a piece of electronics in the waste, I think about this village in Chili who’s water was poisoned by mining operations. Then I have no doubt that every piece of metal, every piece of copper – it needs to be recycled regardless of the time that is consumed in disassembling it. If it’s profitable to open up holes and dig deep into the mountains of this planet, then the answer to the question is yes. It will always be a source of income to claim the metals. Creatively crafting materials out of the waste plastics will be the next revenue stream to consider, as the costs of disposing of these materials may become considerable, especially on an island where most plastics are burned into the atmosphere or polluted into the ocean. If you are recycling materials like this, please comment with your photo’s and thoughts!